#FIBAOQT Final: Canada vs. France Full Video and Results (July 10, 2016) - Balita Boss! Canada and France face off in the final of the 2016 FIBA Olympic Qualifying Tournament in Manila at the Mall of Asia Arena on Sunday, July 10. A spot in the Rio Olympics is at stake in the final matchup between Canada and France. Here's the 2016 FIBA Olympic Qualifying Tournament information for Canada vs. France. Canada and France had 3-0 win-loss record in the tournament. In the semifinal matchups, Canada defeated New Zealand 78-72, while France beat Turkey 75-63 to reach the final. Canada will be trying to beat France to get back to the Olympics for the first time since the 2000 Sydney Games. Canada versus France will be broadcast live on TV5 and HYPER on CIGNAL in the Philippines. The official live streaming video of Canada vs. France is embedded above courtesy of Sports5 YouTube Channel. 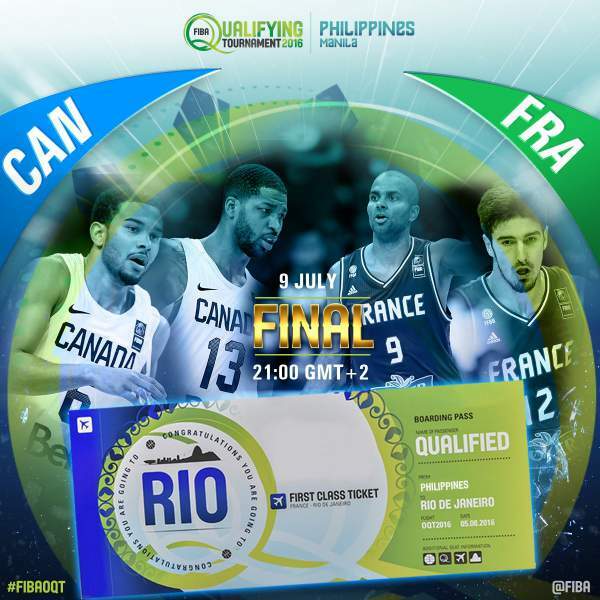 You can also watch the 2016 FIBA Olympic Qualifying Tournament semifinals Canada vs. France live streaming via livebasketball.tv.